Ok, super gross confession time… I usually go 4-5 days without washing my hair. I realize just how disgusting that sounds, but let me explain a few things. I still take showers and wash the rest of me every day, just not my hair (shower cap you are my best friend). This is what works best with my hair type, so I’ve learned to roll with it. It has taken me a few years to train my hair to get to this point. I started washing my hair every other day and it would be super greasy by my next shower. Then once my hair got used to this, I pushed it to 3 days. And then 4. And then 5. There are a few factors that determine how long I go, like the weather (if it is super muggy and my hair has a super weird texture), if I worked out a lot or got suuuuuuuuuuper sweaty, if I put my hair in a ponytail for too long, etc. I wouldn’t be able to do this if it weren’t for the miracle product that is known as dry shampoo. 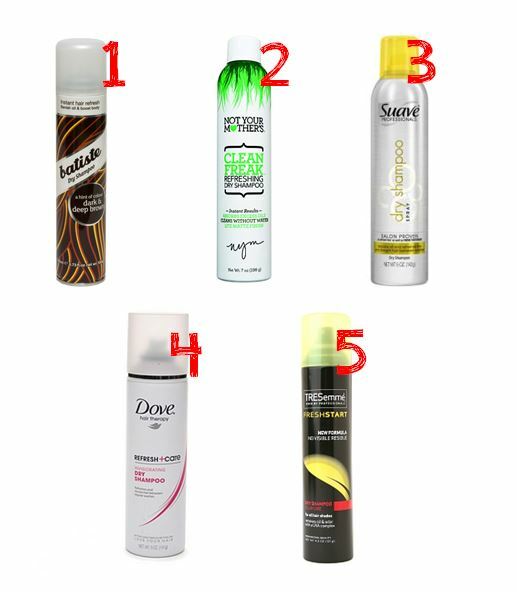 I have been using dry shampoo for 5 years now and I think I have tried just about all of them. There are some that I really love, some that I really hate, and one that I keep going back to. Here is my dry shampoo review! 1. Batiste- This is a great choice as far as I’m concerned. They sell these in really fun and pretty cans, they come in different scents, and they even have some that add a bit of color to the formula to mask the usually white misty powder that comes out. I’ve tried the dark & deep brown before and loved it! It lasted for a few weeks of use, didn’t take too much rubbing in to get it to work, and it didn’t smell horrible either! 2. NYM Clean Freak- THIS IS MY FAVORITE! If you could only try one dry shampoo, TRY THIS ONE! It smells great, seems to last FOREVER, and never seems to leave white residue on my hair. Seriously. Go buy this one right now. Do it. Go. 3. Suave- This one comes in at a close second, but I will admit that it is the cheapest on my list (thank you, Suave!) I noticed that this one leaves quite a bit more powder on my hair and it is harder to get worked in, but man it works really well. This wouldn’t be a bad one to try, either! 4. Dove- Go ahead and save yourself some money and don’t try this. I have never liked it, and I have never even gotten it to work well. Maybe I just bought 3 defective cans (over 3 years…) but each one only gave me 2 uses. TWO! THAT’S IT! It didn’t seem to absorb the oil as well as Suave or NYM, and it seemed harder to work in on my particular hair type. Ehhh, skip it. 5. Tresemme- This was the first dry shampoo that I ever tried, and this was what I used exclusively for the first year that I used dry shampoo. Then I tried Suave, and I can honestly tell you that I haven’t purchased this brand ever again. Maybe they have improved the formula, but it seemed to leave the most white residue and was the hardest to work in. Maybe I’ll give it another chance one of these days… but… maybe not. So there you have it, my personal opinions on what dry shampoos I love and which ones I don’t love so much. If you haven’t tried dry shampoo before, you should- it will change your life! (Ok maybe it won’t change your life… but it might save you some time getting ready in the morning and a few bad hair days!) Are there any that I should try out that didn’t make my list? I’d love to give them a try, too! « Gilmore Girls is on Netflix!!!! !